With the release of jdeveloper tp3 we finally can test the new features. It looks very promising. With the 10.1.3 webcenter release was not working so well. With 11G they fixed the refreshing (partial page rendering) of the whole portlet page when you do a submit in a custom jsf portlet. Popup windows works too , we can use list of values pages. 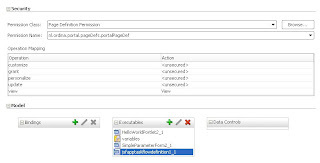 Now we finally can make small fusion applications and registered it as a portlet on the webcenter container. 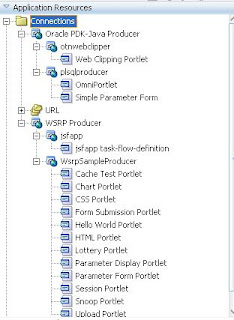 To deploy your taskflow or jsf page as a portlet you only have to select the page or taskflow and use the right mouse button and create portlet entry. The overview of the registered producers is much better, you can register producers to your application or to the resource palette so you can use it in more applications. See the picture. 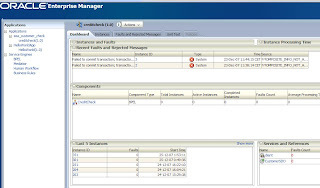 In 11g webcenter you also get some standard taskflows which you can use in your portal. 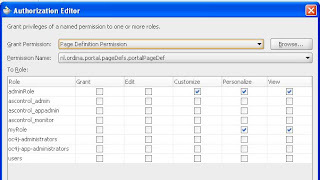 Another nice feature is that personalizing your portal is now very easy, You have to use the adf security wizard. 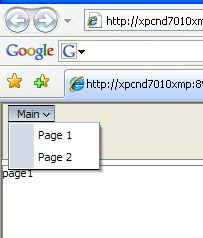 Step 2 go the pagedef of the page and add security to page. and there are a lot of other features with is not yet availible in the tp3 release like the social networking components, forums, announcements, page Service, presence, tasks , worklist and recent activities. With 11g we can mix now portlets with jsf applications. 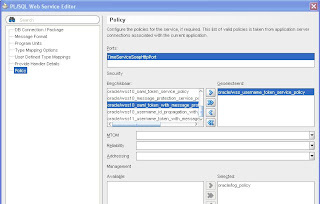 In the jdeveloper 11g tp3 you can configure a soa project where you can use sdo webservice as a reference adapter. 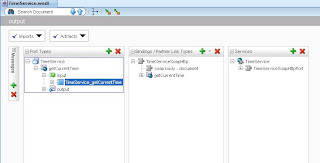 Too bad this is not working (at runtime) in TP3 but this blog will show you how you can use sdo web services in a bpel process and it gives an overview how soa suite 11g works. First what is SDO ? This is a technology which is developed by IBM, SAP, BEA, Oracle etc. 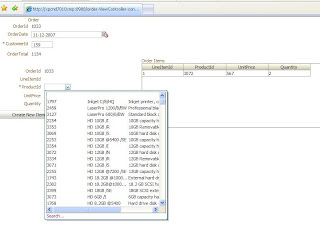 SDO or Service Data Objects is designed to simplify and unify the way in which applications handle data. 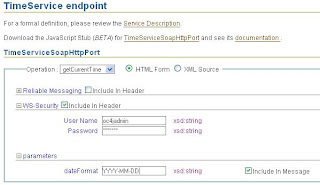 Oracle made it very easy with adf bc (bc4j) to make sdo webservices. 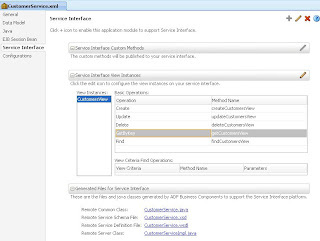 You only have to edit the application module, Go the service definitions link and enable support for service definitions. Select the viewobjects and the operations you want to use. Deploy this to the embedded oc4j and we have our sdo webservice. 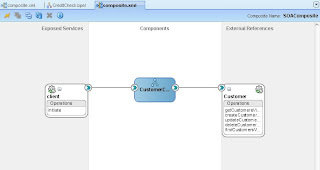 In this example I used the customer table of the oe sample schema. 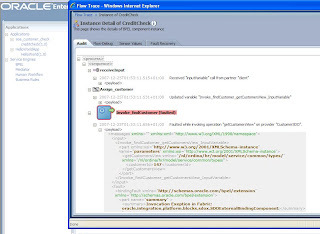 In the viewobject of this customer table I had the remove the following attributes cust_address, phone_numbers, cust_geo_location because these types are not supported by sdo. We are ready to make a soa 11g project. 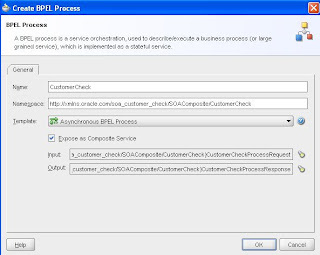 Create a new soa project and open the composite.xml Now drag the bpel process from the component windows to the components area of the composite.xml. Make sure you check create composite service. This is a bit different as in 10.1.3. 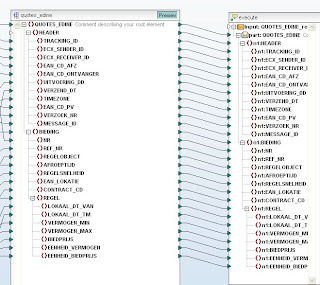 In the composite.xml we define our adapters and which adapters the bpel can use ( the line between the components) . 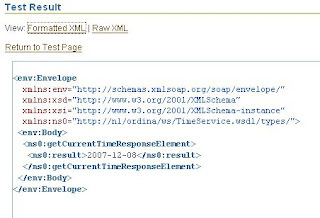 Now we complete the bpel process by clicking on the bpel process in the composite.xml. 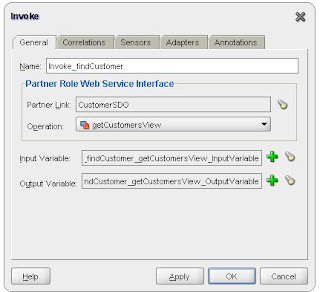 Here we add an invoke service to call our sdo webservice and in this we select the right operation getCustomerView. 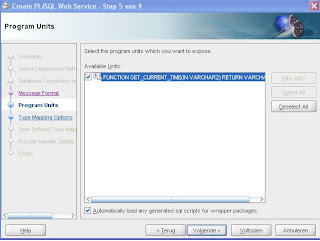 We add some assign activities to fill the input variable of the sdo web service and one to assign the output of the ws to the output of the bpel. Run the composite.xml and go the following url http://localhost:8988/soa-infra/ to test our bpel web service. This goes wrong because in TP3 the runtime support of sdo is not supported in this release but let's look at the soa suite console why it goes wrong. A customer of me wants to have a message handling system which can process dutch energy edifact messages and routes these messages to the right backoffice system. The first problem I had, how to process edifact messages to xml. Oracle has a b2b solution for this but this was not suitable for this case. Then we tried Altova mapforce. This is a mapping tool where you can map xml, web services , files , database and edifact. 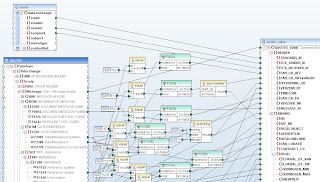 When you are finished in mapforce you can generate java, .net or xslt and integrate this code in your own application. 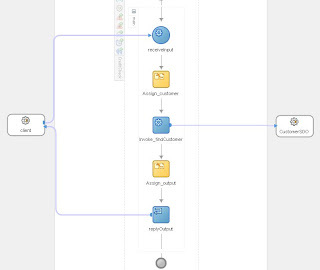 You can map edifact to the oracle database but we want to use an esb or a mediator so we don't have to connect our front with the backoffice systems. 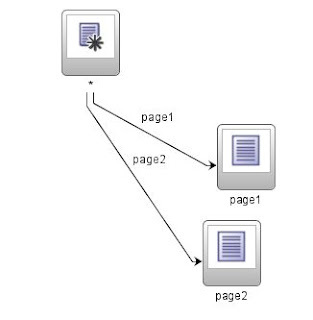 Our solution is that we want to map edifact to a soa suite web service. The first step is to customize the edifact message to the dutch enerqy standard. 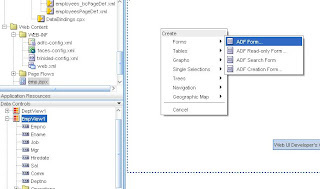 The mapforce edifact definitions are xml files so can easily drop segments, elements and add your own enumerations until your have the right edifact definitions. Because edifact to wsdl mapping is a bit limited by mapforce we make a xsd which looks the same as the final tables definitions. Now we have a edifact to xml to wsdl mapping. 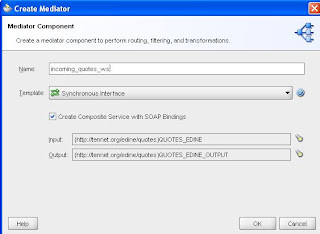 This xsd can we use later for our routing / mediator component in the soa suite. Altova has a great library with a lot of functions and you can make your own functions. It is very easy to use it. 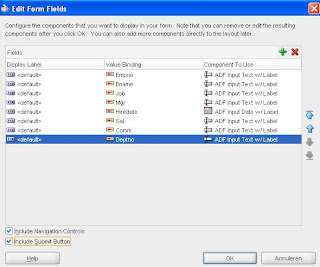 Now we are ready with the first part of mapforce let's look if the edifact -> xml mapping looks fine, you can click on the output window for the result (the try and error principle). 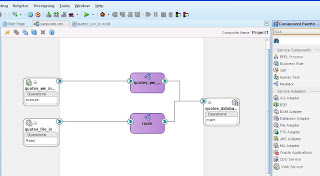 The next step is to add a mediator, make sure you use the xsd which we made for mapforce as input and output and check "create composite service". We have now the web service wsdl which altova needs for the latest step ( xml -> wsdl mapping). Let's finish the soa project by making a routing rule to the db adapter with a xslt mapping. Now we go http://localhost:8988/soa-infra/ to download the wsdl of the mediator. Altova can not use this wdsl directly, we have to change it a little bit ( soa suite generates a wdsl which import a another wsdl). Now we add the wsdl to mapforce and finish the mapping. 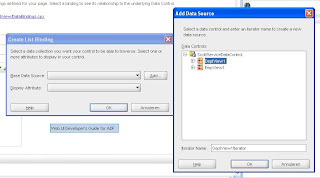 The last step is generate java code in mapforce and import this code to jdeveloper. 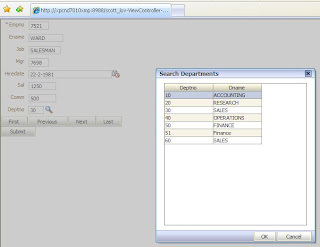 You can integrate this in your application, start the console or the swing application (altova generates this for you. 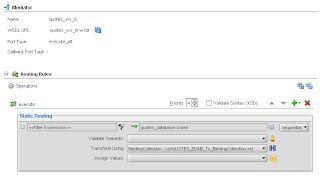 Oracle released jdeveloper 11g technical preview 3, in this release they added soasuite 11g and webcenter 11g. I already played with the soa suite and here are some tip to start with soasuite yourself. First we install a separate jdeveloper home. Don't mix it with your normal adf jdeveloper 11g home. Start jdeveloper go to tool menu / preferences -> run and select integrated oc4j , We are ready to configure the oc4j container. Go to tools menu / configure soa. We have to fill in the soa suite schema user / password. The installation takes a while ( 5 minutes). Step 4 starting the soasuite container by pressing the blue round button with a green arrow point. Here are some screenshots of a mediator project and a picture of new console. Steven, the architect of the jheadstart made a new blog entry over the value of jheadstart when jdeveloper 11g is released. I think jheadstart will always be handy, You can easily generate c.r.u.d. pages, implement security , flex fields , language support , dynamic menu etc. Your customer will be satisfied that you can show a whole application so fast. So you have time over to do make the complex pages. I hope the jheadstart team releases some technical previews else we have to wait a long time because jdeveloper 11g will be released next fall. 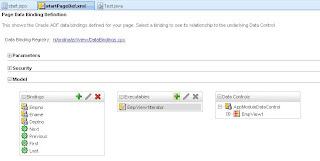 In this blog I will explain how you can create a dynamic menu in jsf pages from a bean. The data of the menu can for example come from a xml or from a database table. 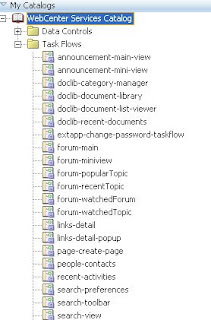 In my other blog I use adf taskflow with a xml menu, this time I use menu items. Now we can create a jsf template with the menubar where we add our menu items. We are ready to create the two pages and we only have to add beforePhase attribute to f:view element. On the left side you have a panelFormLayout where we add the items on it. The panelFormLayout has a footer facet where we add the buttons. On the right side we have two selectOneChoice with 3 buttons. The first selectOneChoice is for the items and buttons which we can add. If we add an item we remove this entry in the add choice and add this entry in the remove choice. The Init button fills the add choice with the values of the pagedef. Here you have the example project for jdeveloper 11g. Thanks for larry.phillips on the otn forums for that the actions now works. As an old school oracle developer I developed my business rules in plsql. I did this with cdm ruleframe or with triggers and packages. But now I want to make a demo on the oe sample schema. In this demo I used the orders and the order_items tables and because it is a demo I want to use bc4j for my business rules. This are the business rules I want to implement. Every order item has to update the total order amount of the order. The Line Item Id of the order items has to an autonumber 1, 2, etc and not a sequence. On the order table the order date has to be current date and the order Id must be the next value of the orders_seq sequence. This is how I did it on the orders view. First I made two calculated attributes CalculatedOrderTotal and CalculatedOrderLines on the orders entity. These attributes I use on the orders items entity. Then I generate the impl java class of the orders entity so I can change the getters of these calculated attributes. /**Gets the attribute value for CalculatedOrderTotal, using the alias name CalculatedOrderTotal. /**Sets value as the attribute value for CalculatedOrderTotal. /**Gets the attribute value for CalculatedOrderLines, using the alias name CalculatedOrderLines. /**Sets value as the attribute value for CalculatedOrderLines. If you want to check the old and new values of an attribute then you can use getPostedAttribute to get the old value of the attribute. This is the same as :old and :new in the plsql triggers. In this method I set a database sequence on the Order Id and the current Date in the Order Date attribute. Making a plsql web service in 11g is very easy but you have to think about your function, procedure and parameters names else it can result in a strange wsdl method and parameter names. Here is a example of a function. The package name is not used in the wsdl creation. If you want to have a capital character then you have to use a underscore _ . Jdelevoper automatically remove the underscore and capitalize the following character. In Oracle plsql is common to use p_format as a parameter of a function but this results in pFormat. So we are ready to create a plsql web service. 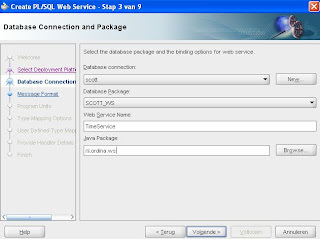 Here we make a database connection and we select the oracle package. Let's make it a bit more interesting by using security and logging. Let's start the webservice and look at the result. As username I use a standard account oc4jadmin. You can also use an another account but you have to edit the jazn of the embedded oc4j. We use all employees attributes with include navigation controls plus include submit button. We don't have the department iterator so we have to select it first. We select all the attributes of the department iterator. Open the pagedef and rename the list of values ID to DeptnoLOV. This is how the list of values looks in the pagedef. Now go to the page and select the last column and insert input list of values. 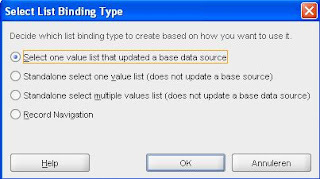 returnPopupListener attribute of inputListOfValues is very important, here is the method defined which copies the value of the lov to the deptno of the employee. You can also have launchPopupListener where you can limit the records of the lov. Now we can delete in the jsf page the deptno column of the employee form because we have now the lov. If you don't like the LOV or inputListOfValues you can also use a combobox or inputComboboxListOfValues. You only have to use this code in the page and replace the inputListOfValues element. 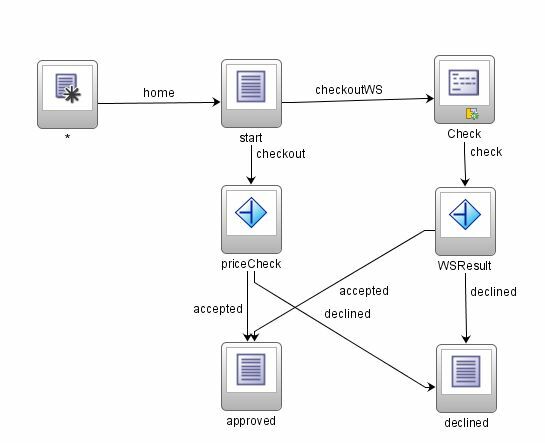 ADF taskflow supports indirect web services. This gives us new possibilities such as calling esb and bpel web services or integrating a normal web service in our flow. Integrating web services in our taskflow is easy. You can do it in 3 steps. The first step is done by making a web service proxy or much easier an web service datacontrol. 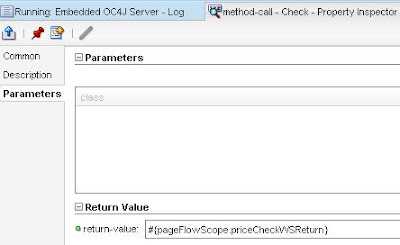 The second step is making a taskflow method call (drop the datacontrol method on the taskflow) and the last step evaluating the result of the method call by using a taskflow router. This blog gives you a guide to do this. This example is a credit check if you put in the start page a value below 200 then it is approved and above 200 it is declined. The credit is done with a router and with a method call /router. First we create a fusion project. Now we have an empty adfc-config.xml, this is the unbounded taskflow. In this taskflow I create 3 views start, approved and declined. On the pages approved and declined I only put in an outputtext with approved or declined. This is the start page. In the taskflow routing and in the start page I use the following simple backing bean. In this taskflow you are already see the web server method call. I will explain this later in this blog. Let's look at the properties of the router priceCheck. The default outcome is declined, this value is used when StartPage.approved = false when this is true then the outcome is approved. We are ready with the router example. Let's make it a little bit interesting by calling a web service which does the credit check. We make a new empty project in the same workspace. Make a java class with a method which has 1 parameter price and it returns true when the price is below 200 else false. Create a web service on this method and deploy this on the oc4j server in the jdeveloper home. 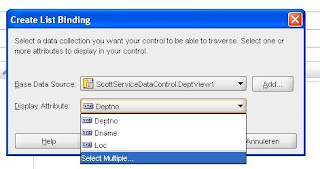 We go back to the viewcontroller project where we create a web service datacontrol on this web service. We drop the created datacontrol on the taskflow. Now automatically a method call with a pagedef is created. I only have to fill in the fixed outcome so the control flow case goes the router where the result of the ws is evaluated. We have the store the result of the web service in a variable so the router can used it. The router is almost the same as the first router. We are ready to test it. Here you have the example project. To run it you have to deploy the web service to the jdeveloper oc4j server first.